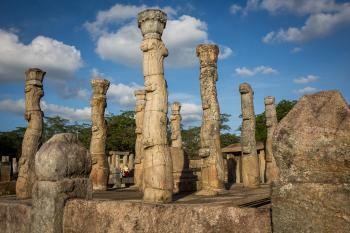 The Ancient City of Polonnaruwa comprises the remains of the second capital of Sri Lanka. 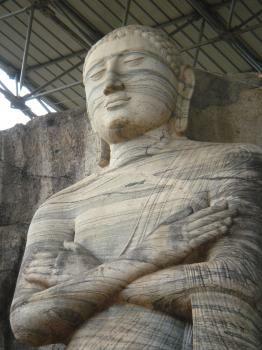 Polonnaruwa succeeded Anuradhapura as capital of the island now called Sri Lanka at the end of the 10th century. The Indian Chola Dynasty ruled the island at that moment, but after they were driven out Polonnaruva remained the capital. The city had its cultural heyday under the leadership of King Parakramabahu I in the 12th century: the buildings, parks and the large tank date from this period. Polonnaruva fell to the Hindu Tamils in the 13th century, and became deserted. The capital then shifted eastwards to Kandy. There are several groups of monuments left: highlights are the Royal Palace of Parakramabahu and Gal Vihara, a group of very large Buddha-statues. 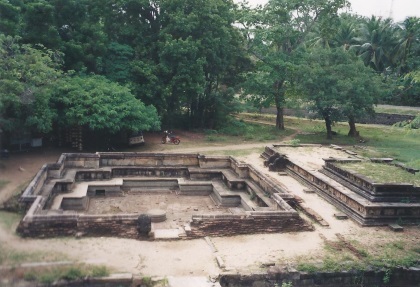 This site is in much better repair than the one at Anuradhapura: there is actually more to see than just ruins. The old city can easily be discovered on a bike. Our bicycles were in terrible condition. I am not totally sure anymore (I have rented so many bicycles in Asia that I sometimes mix up the occasions), but in my memory I got a puncture before arriving at the first monument. According to my photo collection I still managed to visit a big part of the site, but how? I couldn't help but compare the style and layout here to sites like Angkor. Interestingly, there are some links between the sites, in terms of architecture an diplomacy. However, while the Cambodian temples are enormous and often defined by their height and land area, the structures of Polonnaruwa show their significance in their artistic details. The way they fit together into an urban design and the relationship to nature are also part of the wonder. Like any city, there are different ways to get around Polonnaruwa to see the different temples and buildings. Bicycle is popular, tuk tuk or bus tour another, and it would even be possible to walk if you're feeling fit. As mentioned before, Polonnaruwa is a top whs in Sri Lanka. I visited the city on a 3 day tour to the cultural triangle that also included Dambulla, Sigiriya and Anuradhapura. A round ticket is a must, as it covers all sites (except Dambulla) for 50 USD. Single entry would be 25 USD for each site (foreigners pay about 20 times more than locals for most sites in Sri Lanka). Don't miss the quadrangle with its beautiful buildings. The site is extensive and there is a lot to see. You need private transport to cover the whole site in one day. Polonnaruwa, the second capital city of Sinhalese for three centuries, is one of the most interesting places in Sri Lanka with many well preserved ruins of palace and monasteries which easily can make every tourist to impress. After Anuradhapura was attacked by many invasions from India, Sinhalese decided to move their capital to this area for good reason. Although Polonnaruwa does not has long history as Anuradhapura has, but in this short period the zenith of Sinhalese art glory has reached. Polonnaruwa historical core area is divided into three complexes; royal palace, Quadrangle, and crematory collage. Each complex has its own uniqueness and deserves time to visit. The royal palace complex has big ruins of seven stories palace and audience hall with lion throne. The Quadrangle is believed to be the royal chapel with many fascinating buildings; the main attractions are the sophisticated round shape Vatadage and Polonnaruwa's temple of the Tooth, Hatadage; however do not forget to admire the small but beautiful Latha Mandapaya, its pillars is the real gems and one of my favorite. The crematory collage is a very large complex with monasteries, ancient hospital and Buddhist collage. The Rankot Vihara, a very big pagoda similar with Anuradhapura, is the center of this complex, and nearby hospital has evidence of ancient toilet and spa liked room, a very civilized place. While the Lankatilaka building will make you surprised with many similarities to Sukhothai, the world heritage site in Thailand showing these two cities cultural connection, Gal Vihara, the group of rock cut Buddha images, is considered to be the real reason for visiting this city by many people, will make your breath away with its unbelievable beauty and serene of the Buddha images. In my opinion, Polonnaruwa is the best world heritage site of Sri Lanka I have visited, each ruined structures is unique with no similarity, the atmosphere is also relax and peaceful, a real contrast with Anuradhapura which quite strict and most of the ruins are the same, so I highly recommend to visit Polonnaruwa, the fascinating treasure of Sri Lanka. I agree with Paul. The Gal Vihara is a world class site. It is truly wonderful. The whole place is just great, and is well worth a visit. 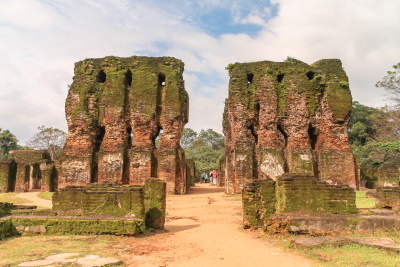 Polonnaruwa is a very extensive ruined city consisting mainly of palace structures and religious buildings and containing at least 2 “world class” architectural/artisitc sights together with plenty of other atmospheric/memorable locations. They are quite widely spread out in a wooded “park” (A rented bicycle could be useful if you don’t have a car with driver) and it takes at least half a day and preferably more. We only had a full half day unfortunately and, if our experience at other Sinhalese sites is anything to go by, the legendary bureaucracy of that country makes leaving the site for lunch and returning on the same (expensive for foreigners) ticket impossible. It would be interesting to hear from other contributors whether it IS possible to get a “pass-out” as planning a visit would be helped by a definitive answer. Of course it may depend on the whim of the gateman – at Yala National Park we were left to sit under a tree at the entrance gate for half an hour whilst our jeep, driver and guide went “out” to the Park office to pick up their lunch – it was more than the gateman’s job was worth to let us “out” even for that small distance! Unfortunately also the really excellent museum is outside the gated site (but included in the multiple part “tear off” you get if you buy a “Cultural Triangle” round ticket). It is a tough call whether to visit it before or after the city – I would favour the latter to put everything into context and remind you of the wonders but no doubt others would disagree! Again it is so typical of Sri Lanka to require this unnecessary choice. There are some nice “reconstructions” to show how the buildings would have looked originally and to explain things such as the water system. The museum is situated near the wall of the man made “Tank” (ie the huge lake) which provided the basis for Polonnaruwa’s agriculture. b. The Gal Vihara - a group of Buddha images carved out of the living rock with a particularly fine “Reclining Buddha entering Nirvana”. If you have read my reviews of other Buddhist sites in eg India and China you will know that I am not a great aficionado of Buddhist art but this group is special. For the rest just soak up the atmosphere and enjoy the little details. Pyramids: Sathmahal Prasada, a pyramid shaped, seven storied building, thought to be an unusually shaped stupa. Irrigation and drainage: Has large "tanks" and associated irrigation canals etc. These were built to enable the city to run and feed itself as it lies within Sri Lanka's "dry zone"